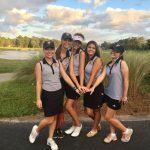 The girls golf team lost a close match to North Myrtle Beach at Eagle Nest on Tuesday, August 28. Senior, Joey Kirkman, was the medalist of the match with a low score of 38. Congrats Joey! 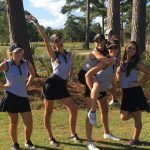 The girls travel to Pawleys Plantation today (Thursday, August 30) to take on Georgetown. 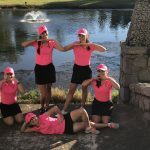 Good luck girls! 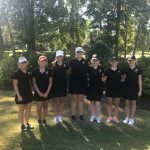 The Lady Braves qualified for the State Tournament by finishing 6th place on Monday, October 16 at the AAAAA Lower State Tournament at Country of Club of South Carolina in Florence. 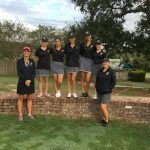 Despite the harsh conditions of rain and wind, the Lady Braves scored a team low total of 361. Senior, Laswon Devers, scored a solid 84. 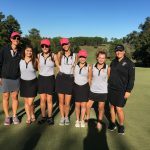 The Lady Braves placed second, two strokes behind Carolina Forest, on Monday, October 9, in the Region VI AAAAA Tournament at Traces Golf Course. Senior, Lawson Devers, placed in the top six which qualified her for the All Region Team with an 88. Junior, Joey Kirkman, scored a 89. Senior, Alisa Berindea, scored a 93.